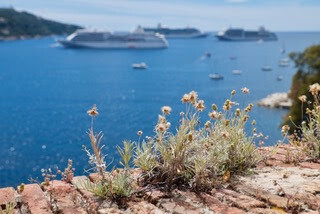 For the final day of the World Cruise, we headed to beautiful little Riviera town of Villefranche, where we were able to get our first glimpse of Sliversea's new ship – the Silver Muse. 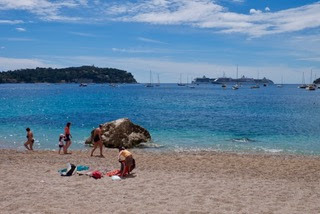 Before hopping onto the Muse, we had a quick look around Villefranche, which was looking pretty good in the lunchtime sun. Its row of waterfront restaurants were all doing a brisk trade, while the beach had quite a few people sunbathing (although not many people swimming – the fact that there was snow on the mountains behind the town, suggested the water would be way too cold). After looking around the medieval fortress, we headed over to see the Muse. It's a stylish addition to the Silversea fleet – much more contemporary in its decor and furnishings than the more traditional Silver Whisper. With 8 different restaurants there's a lot of dining options, and everything of course was sparklingly new. 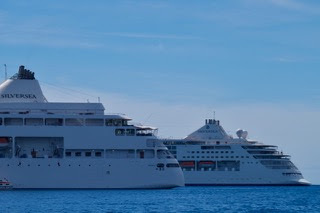 But, what makes this cruise line special, has always been its crew – so, it was nice to see so many familiar faces amongst the staff. With a new ship and plenty of old hands, I'm sure that the Muse is going to be a success. Seeing as our next assignment will be on the Muse, (in September doing the transatlantic crossing), as we prepare to leave our current mother ship, it was nice to look around what will be our next oceanbourne home in five months time.